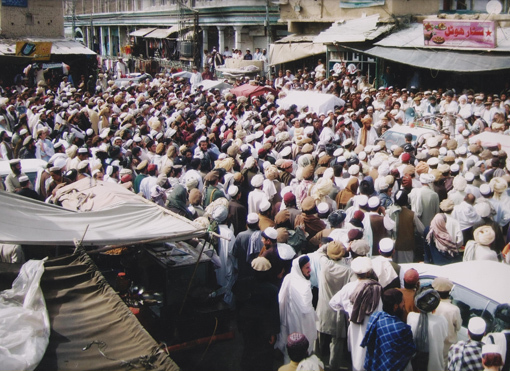 Two years ago a US drone strike in North Waziristan killed up to 42 civilians. There has never been an independent and impartial investigation or even an official acknowledgement of the strike. Despite estimates that as many as 3587 people have been killed by drone strikes in Pakistan alone, the US lethal drone program there remains officially unacknowledged. Meanwhile, the US Government speaks generally about its use of armed drones with an Orwellian lexicon that characterises strikes as ‘clean’, ‘precise’, ‘efficient’ and even ‘ethical’. It simultaneously applies more realistic language to the names of the armed drones themselves, which go by ominous monikers like ‘Predator’ and ‘Reaper’, and are equipped with ‘Hellfire’ missiles. When a drone operator presses a button hundreds of miles away, striking a person with a missile, they call it a ‘bugsplat’. For the people the strike misses, who run away in such terror they involuntarily urinate themselves, the military slang is ‘squirters’. As George Monbiot says, ‘beware of anyone who describes a human being as something other than a human being’. 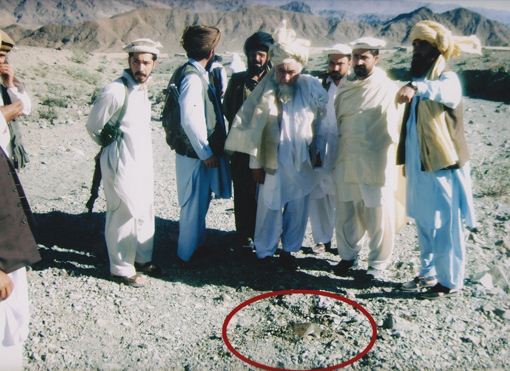 On 17 March, 2011, at approximately 10:45am in Datta Khel, North Waziristan, a US drone fired at least two missiles into a traditional meeting of elders (jirga). An article at the time by the Daily Telegraph incorrectly stated ‘more than 38 suspected militants were killed’, with information provided by – as usual – anonymous ‘intelligence sources’. It is generally accepted that about 45 people were present at the Jirga; the Bureau of Investigative Journalism reports that up to 42 civilians were killed. In Pakistan I spoke to relatives of drone strike victims, including those of an 18-year-old student and 23-year-old labourer killed in this strike. ‘The drones had been flying low all day,’ a cousin says. When it struck he immediately recognised the familiar sound and travelled 14 km by foot to reach the site. ‘It was a very scary sight because there were body parts all over the place,’ he recalls. ‘More than 42 people were gathered at that jirga. It was like pieces of meat laying everywhere and some people you couldn’t even recognise. But I was able to recognise my cousin and send his body home – one of his arms and one leg was missing.’ He tells me his cousin ‘was very dedicated to his studies and would help his mother after school’. 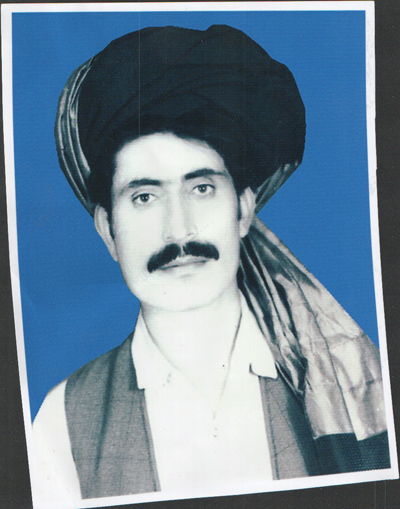 An estimated 35 tribal elders (or maliks) were also present at the jirga and many, if not all, were killed. The Government employs many of these maliks. The community also relies on them for knowledge and leadership and often they have large families who are dependent on their incomes. It is hard to understand what military advantage was achieved by this wholesale slaughter of elders. Without the guidance of this older and wiser generation, many young men will grow up without mentors, with only the memories of their violent deaths; with very little to stem the appeal of extremism. One of the many people killed that day was Malik Daud Khan, who chaired the meeting. He was a respected community leader and public servant. His son, Noor Kahn, has launched legal action against the Pakistani Government in the Peshawar High Court for its responsibility in relation to the 17 March strike. His petition to the court also notes that his father ‘was a supporter of the empowerment of women, as evidenced by his efforts to establish a Women Skills Development Centre in his village’. The Chief Justice is expected to hand down an order in the case in coming weeks. In late 2012, in the UK Royal Court of Justice, Noor Khan also filed a legal challenge to the UK Government’s reported intelligence cooperation and support for the US drone program. A judge in the case stated his victim statement was ‘very moving’, but in late December 2012 the two presiding judges rejected the application. They concluded ‘[i]t is plain, from the nature of the claims, that the purpose of the proceedings in England and in Pakistan is to persuade a court to do what it can to stop further strikes by drones operated by the United States.’ Had the challenge been upheld, UK officials who provide intelligence for lethal US drones strikes could potentially have been charged under domestic criminal laws. The cousin explains that there was a team of 12 people and it took them four hours to sort through the body parts, try and identify people and to gather the dead bodies. ‘We were extremely afraid because three drones continued to fly above and we feared a secondary strike, because it has happened before, where they strike the rescue teams.’ US military slang for a secondary strike aimed at rescue teams is a ‘double tap’, it is a tactic more commonly associated with insurgents and based on the logic that first responders must be up to no good. Such brutality sits in stark contrast to the clean reputation of drones. In his April 2012 speech John Brennan described drones as surgically precise with ‘laser-like focus’, stating further, ‘one could argue that never before has there been a weapon that allows us to distinguish more effectively between an al-Qa’ida terrorist and innocent civilians’. There have been 315 drone strikes in Pakistan alone under President Obama. Drone strikes in Yemen and Somalia also continue. The Bureau of Investigative Journalism estimates that as many as 197 children have been killed by lethal drones in Pakistan. Yet, in a complete contradiction of Obama’s stated policy, it is well known that the US government uses ‘signature strikes’. That is, people are targeted when their identities are not known based upon ‘suspicious’ behavior or patterns of activity. Needless to say, such strikes heighten the likelihood of killing innocent people. According to the Washington Post most attacks are now ‘signature strikes’. Compounding this even further, the US government considers all military-age males in a strike zone as a militant unless ‘they can be posthumously proved otherwise’. The graphic reality and daily terror of lethal drone strikes were well documented in a September 2012 Stanford and New York University Law Schools report entitled, ‘Living under Drones’. The report conducted over 130 interviews with victims, witnesses and other community members. The reality of individual strikes presented in victim testimony differs markedly from the dominant US government narrative. For people living in areas where drones operate they are terrifying and they often kill innocent people. They are collectively punishing and traumatising entire regions and risk further fuelling extremism. For these people, comparisons to the fine lacerations of the surgeon’s scalpel are absurd; they experience an ever-present robotic death squad in the sky which fires explosive missiles into their houses, weddings, mosques, schools, communities and jirgas. Their stories are slowly emerging from the rubble of misinformation left by the US government. We have a responsibility to pay close attention. Recently, ten of the leading human rights and civil liberties organisations, including the American Civil Liberties Union, Human Rights Watch and Amnesty International, sent a letter to President Obama voicing their shared concerns regarding US drone strikes and targeted killings. Very real questions need to be answered about the US lethal drone program. Without the most basic details, it is impossible to even contemplate safeguards. They are clearly urgently needed, including a reassessment of how intelligence is gathered and verified. The names of victims ought to be recorded and made public. The public is entitled to know at the very least, which agencies are carrying out the strikes – including outsourced private contractors. The US armed drone program is no joke; nor is it insignificant or small in scale. It is a key plank of the US global counter-terrorism policy. It has already killed thousands of people, and is now being further expanded. It involves the normalisation of killing beyond the checks and balances of due process, Congress and courts. The practice of rejoicing in the supposed efficiency of the tool and refusing legitimate questions must end. It is perpetuating a distorted and one-sided version of how these drones operate and what they achieve. Historically, truth is the first casualty when war comes around, and the undeclared lethal-drone war is no exception. For a democracy founded upon the rule of law this is intolerable. The US public and global community, more generally, deserve the truth so we can reflect upon the true nature and costs of this program. As for the civilians who live in regions where drones operate, as a cousin told me that day in Pakistan, ‘we just want the mass murder to stop’. *This piece is a longer version of an article originally published on the London Review of Books. The drone story is just unfolding and its good to see a piece like this. The US drones operate illegally by United Nations laws yet go largely unquestioned. When some at the UN have asked questions they’ve been been unanswered. This needs to stop. So a bomb goes off in a US city and we are subject to its news headlines as the world is held accountable, but US drone attacks make no news splash and there is no accountability? Good to read articles like this then that tell stories of those who mourn drone attacks, for surely the mourning accompanying the US explosions will be reason enough to re endorse the drone program. The drone makers profit from these strikes so this won’t stop unless our government decides to stop hurting people in other countries for the profit of few in the U.S.